Built on a high rocky hill, the castle is the large visible fulcrum of the small Umbrian village of Giove, so called for the presence already during the pre-roman era of a temple dedicated to the father of the gods. Numerous archaeological rests discovered on the communal territory (tombs, ruins of buildings, coins, etc.) and the ruins of the fluvial port of San Valentino on the Tevere, testify of the antiquity, as well as the wealth of the settlement that gave birth to the medieval village. 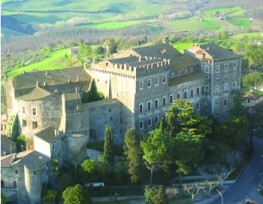 The first historic references about the castle, originally called "Castel di Juvo", are dating back to 1191. In its secular history, the medieval part of the castle has been enriched by precious architectonic interventions that have contributed to define its actual lofty aspect. Terraces, courtyards, rooms and secret passages still to discover, are the articulated structure made of five floors illuminated by 365 windows, one for each day of the year. Exceptional painted works on mythological themes made by maestro of the 16th century such as Domenichino and Paolo Veronese, testify nowadays of the importance and prestige of the families that have lived in the castle throughout the centuries. During all the middle Ages the castle and the village, for their strategic importance, have been the theatre of hard fights between the most important communes and families of the area. During the 14th century it is subdued by Amelia, by Narni, then by the signor di Baschi and at the end by the Tuscan cardinal Giovanni Orsini who besieged it and took it. Pope Giovanni XXII intervened taking back the castle and imprisoning the cardinal Orsini in Amelia. During the 15th century Giove falls in the hands of the Anguillara family, first allied and then enemy of the Pope. Paolo II Farnese, in 1465, conquered the castle again and put it directly under the rule of Rome. Cesare Borgia, in 1503, dismantled all the defensive works of the fortress. In 1545 Ottavio Farnese, Duke of Castro and Ronciglione, ruled the stronghold of Giove through his daughter Contarina Farnese. At the beginning of the 20th century the castle was sold to the Ricciardi family and therefore went to the general of Robilant and at the end in 1936 to the Conti Acquarone, to who it was purchased in the 80's by the actual owner. Bella Umbria thanks Ms. Annamaria Calderaro for the realization of this article.